It’s New England 100%, through and through. I was asked to post another Fall recipe, and I can’t think of a better one! Pumpkin bread; it’s one of those easy to make, wonderful baked goods that will make your house smell like a yankee candle for the day. It isn’t quite bread, not quite cake, but lies somewhere in between. I guess you could characterize it as a coffee-cake; sweet, highly seasoned, very fragrant, and must be eaten with something warm to drink, like coffee or hot chocolate. In my opinion, you wouldn’t want to slather this with frosting, decorate it with berries and serve it as dessert. There are a lot of pumpkin bread recipes floating around out there, all of which are similar in one way or another. I mean, it is what it is. This is by no means ‘my’ recipe, but there are a couple of things that make this unique and probably better than others. -I use whole, organic and unsalted butter. The flavor really comes through! -I incorporate actual shredded pumpkin in the batter. And why not? We put shredded carrot in carrot cake, and it’s delicious. It’s a low temp baking process, which allows for the dough to completely and evenly cook (you don’t really want the top to brown, per se) and allows for the raw pumpkin to cook through. This employees the scone, or ‘muffin’ mixing process, by which you do not want to over work any part of the dough; be as gentle as possible. I left out other goodies, like chopped walnuts, toasted pepitas (pumpkin seeds), maple glaze, and so on. This is just the bread, and really, it should need anything else other than a good cup of coffee. Heat an oven to 325. Liberally grease 2 baking loaf pans. Sift together the flour, spices, salt, sugar, baking powder and soda. In a separate bowl, lightly whisk the eggs, melted butter and pumpkin. Gently fold the wet into the dry. Just like scones, do not overwork (a few lumps here and there are okay). Evenly divide the batter between the two loaf pans. Bake, about 1 1/2 hours until a toothpick comes out clean. Let cool slightly, remove from baking pans and let cool on a wire rack. Serve right away, freeze right away, or once cool, wrap tightly and it can be saved for a couple days at room temp. Just put it in a microwave for a minute before serving. Make this on a late October day when the leaves are down and the rain is pouring. It was designed for days like that. And then I guess afterwords I'll have to eat it because nothing should ever go to waste like that…am i right? Meghan you are correct! It does, however, freeze very well and can be used throughout the cold seasons. Or just make another one when you need it! I've been remiss in checking your blog lately (sorry, I was on vacation, lol), and came back for an entire cookbook full of recipes! 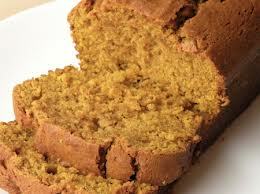 I was never a pumpkin bread person until last year when I stumbled on a great recipe. I challenge you to a pumpkin bread duel! Just kidding, you'd win hands down I'm sure. I will share my “secret” that's not really a secret: Trader Joe's pumpkin puree is the best! Happy (almost) fall! This sounds delicious! I'm planning on trying it out this weekend.